Covenant Relationships: "I hereby give you the license to abuse me"
Ladies, stop fooling yourselves! When a man takes advantage of you and treats you like dirt, there is no justification for you to go back to him, especially if he has not changed! Jeez, these days, I see ladies entertaining the ex they claimed robbed them of their self-esteem, dated them for five years and then dumped them to move on to someone else. My question is always "what are you doing with him?!" and the response is always "i just don't think it's a good idea to dwell on the past". Well, news flash- YOU ARE DWELLING ON THE PAST BY ENTERTAINING HIM! He's not back to seek your forgiveness, he's not back to ask if you guys can make things work because he is a changed man, he is simply hanging around, hoping to enjoy boyfriend or even husband benefits without the commitment and because you don't want to dwell on the past, you let him enjoy those benefits then lament someweher down the line that he went off to marry someone else. Some of us even go back crying to the guy that called us demeaning names that would make our great grandparents turn in their graves! Renew your mind! You deserve to be treated with love and respect. If a man can't offer that, then let him go. For goodness' sake, you won't die of a heart attack if you spend some time as a single lady, hanging out with your friends and pursuing your own happiness! Stop entertaining the poisons from your past. Send the devil packing and make sure he doesn't leave his bags behind. I am not saying you can't be friends with your ex. Sure you can! But only after you have worked on yourself and accepted the fact that he is not worthy of your love and can only be an acquaintance. 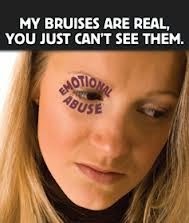 Stop giving the license to abuse, You are worth more than you think in the hands of the one who created you.